11 June 2012: We have Jubilee, the Derby, the Paris Open, Euro 2012, and are looking forward to Wimbledon and the Olympics. But look at it climatically! This diagram illustrates what a horrible Spring we have had for PV and thermal capture. June is only 11 days done, more than a third of the month. If it continues this way, June would score as little as March, April or last September. 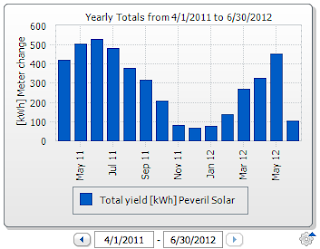 Look at June 2011, in which the monthly score safely exceeded 500 kWh! This month of June 2012 looks only likely to achieve 300 kWh. More rain is forecast for the rest of this week. It has done a great service for gardeners in ending the drought and removing the need for regular watering! 17 June Postscript: Up to this date, June 2012 has only scored 183, and in the same time slot of 2011, the PV system scored 317 kWh. We have a very similar graph to you on our office. This years weather has been really strange. We have had a months rain in 30 hours which caused chaos with some of our readings from our solar thermal products. Lets just hope July is not the same or we will be under water.